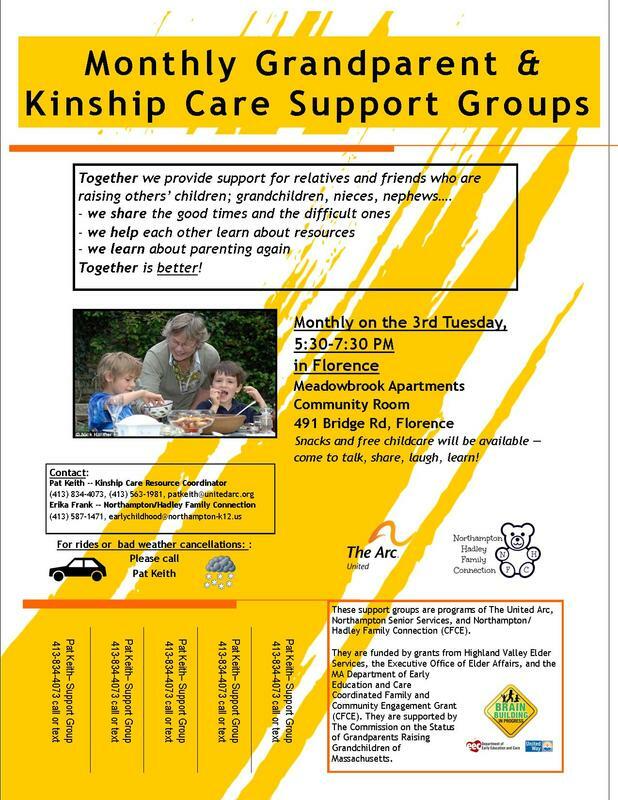 ​A free, drop-in support group for grandparents and other family members who are raising children. Free childcare, snacks, on bus line! 491 Bridge Road, Florence, MA. As a grandparent (or other family member) going back to full-on parenting, you are in a situation you might not have expected to be in at this stage of life … come meet and join others in our community who are also doing this. You are not alone! There is support; there is help; there is a broad community to be with you and your family as you grow together. This group is primarily intended for grandparents parenting grandchildren 12 and under. Meadowbrook Apartments is on the bus line. Snacks will be provided. There is no childcare, but younger children are welcome to join you. Offered by the Northampton-Hadley Family Connection and The Arc in Greenfield.